Get Your Fitness Fix at Rosewood Little Dix Bay in the B.V.I. As the sun was beginning to slip behind the bay, I wasn’t anywhere near Rosewood Little Dix Bay’s crescent-shaped beach. Nor was I clad in some breezy sundress, sipping a rum punch by the bar. While other guests at the resort were doing what most people like to do in the Caribbean – that would be relax – I was dressed in workout gear, prepped to spend the next 90 minutes hoisting a 25-pound kettlebell over my head. Although I was no sight to behold during the balmy outdoor class, the scenery was beautiful: sea, sand and that setting sun. I had flown to the Virgin Gorda getaway in the British Virgin Islands to dedicate several hours a day to contorting, lifting, calorie melting, and sweating as part of the resort’s new series of yoga and fitness retreats run respectively by yogi Johnny Anzalone and Frankly Fitness founder, Frank Baptiste. Little Dix’s program is part of a growing trend happening at warm weather hideaways around the globe: One-of-a-kind fitness retreats taught by coveted instructors in locales that also allow vacationers to get their much-needed chill on. I know this may sound like an alien Caribbean concept to some, but for anyone who believes that physical fitness equals a happy and healthy life (not to mention lifespan), the idea of having access to amazing instructors in an amazing destination is kind of brilliant. So this is how I found myself splayed on a mat at 8am each morning, doing my best to loosen up post-sleep leg muscles while rolling a tennis ball up and down my calves. It was necessary, given that the next hour consisted of I-never-would-have-thought-to-try-that stretches and heart-pumping sets of jumping jacks. Baptiste, who designed the fitness program around his “Move Well, Be Well, Feel Well” philosophy, leads each class in a manner best described as “this sweet smiling, rather Zen instructor could convince anyone to skip the beach and spend an hour in his Jump Rope Techniques class.” I know because I myself was snookered into it. Of course, it’s not all hard workouts all the time. Following each morning session, attendees have several hours to play – Little Dix has its own 7-court tennis center, snorkel and scuba trips, and several day sails, just to call out a few diversions – before each afternoon fitness clinic. 21st Century Core Training, anyone? Added incentive: If you book the resort’s Wellness Retreat package, you’re treated to a massage at the resort’s hilltop Sense spa. Island-centric indulgences include a Salt Island scrub, with granules sourced from a nearby isle, and a Natural Neem Facial, using a paste blended with aloe and ingredients from local Neem trees. I opted for the Caribbean Breeze treatment, a combination pineapple-papaya scrub, aloe body wrap, and a Kukui massage that all takes place in an open-air room, the sound of the sea further lulling me to bliss. 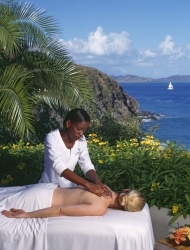 The four-night, two-person Wellness Retreats at Rosewood Little Dix Bay package starts at $3,308, including accommodations, two classes per day, one massage per person, and transfers from Tortola. For general trip-planning information, see our British Virgin Islands destination guide.